Crowdfunding | Why I Stopped Making Merch for a Revolution That Does not Happen. 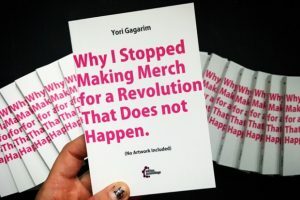 I just published my 3,5 Book „Why I Stopped Making Merch for a Revolution That Does not Happen.“ at edition assemblage. But since putting out even tiny books for a small price still costs a bit to cover most expenses we put up this fundraiser to keep it real. You can order the book from now on in any bookstore in case they don’t have it already OR you can get it via this awesome fundraiser together with some fine rewards I put together for you. Besides lots of merch (yes! ), you can get handwritten quotes from the book. 14 to be precise. One for each „active year“ of mine. And every book will be signed and inscribed if you like. More details in the fundraiser. kürzlich ist mein 3,5tes Buch „Why I Stopped Making Merch for a Revolution That Does not Happen.“ in der edition assemblage erschienen. Da aber leider auch das Drucken von kleinen Büchern etwas kostet und wir es zu einem erschwinglichen Preis anbieten wollten haben wir diesen Fundraiser erstellt, um zumindest die meisten der entstandenen Kosten zu decken. Das Buch ist ab sofort über den regulären Buchhandel zu bekommen, ODER aber über diesen Fundraiser, in Verbindung mit ein paar tollen Belohnungen. Neben viel Merch (ja!!!) gibt es ein paar handgeschriebene Zitate aus dem Buch zur Auswahl. 14 um genau zu sein. Für jedes „aktive Jahr“ eins. Und jedes Buch werde ich signieren, auf Wunsch auch mit Widmung.